In September, Oxford University Press will publish Islamic Law and International Human Rights Law edited by Mark S. Ellis (Executive Director, International Bar Association), Anver M. Emon, (University of Toronto Faculty of Law), and Benjamin Glahn (Former Program Director, Salzburg Global Seminar). The publisher’s description follows. The relationship between Islamic law and international human rights law has been the subject of considerable, and heated, debate in recent years. The usual starting point has been to test one system by the standards of the other, asking is Islamic law ‘compatible’ with international human rights standards, or vice versa. This approach quickly ends in acrimony and accusations of misunderstanding. By overlaying one set of norms on another we overlook the deeply contextual nature of how legal rules operate in a society, and meaningful comparison and discussion is impossible. 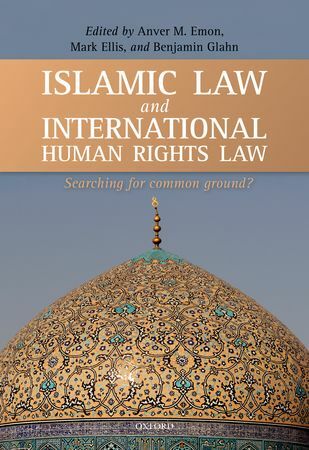 In this volume, leading experts in Islamic law and international human rights law attempt to deepen the understanding of human rights and Islam, paving the way for a more meaningful debate. Focusing on central areas of controversy, such as freedom of speech and religion, gender equality, and minority rights, the authors examine the contextual nature of how Islamic law and international human rights law are legitimately formed, interpreted, and applied within a community. They examine how these fundamental interests are recognized and protected within the law, and what restrictions are placed on the freedoms associated with them. By examining how each system recognizes and limits fundamental freedoms, this volume clears the ground for exploring the relationship between Islamic law and international human rights law on a sounder footing. In doing so it offers a challenging and distinctive contribution to the literature on the subject, and will be an invaluable reference for students, academics, and policy-makers engaged in the legal and religious debates surrounding Islam and the West.